There has been a great deal of talk in the media and elsewhere about the new tax overhaul signed by President Trump in late December. This has included a great deal of misinformation about what the bill actually contains. Many experts tried to analyze what they thought the bill would contain prior to passage, and others were simply misinformed or mistaken. Here are some of the common misconceptions I have either heard from clients or seen in the media. This bill increases taxes on the middle class – The vast majority of middle class taxpayers will get a tax break from this bill. One good analysis I read showed that the average middle class taxpayer would see a decrease in tax of 8 – 10%. In reviewing scenarios from my client base, this appears pretty accurate. The bill has new lower tax rates for virtually everyone but it also eliminates some tax deductions. It is possible for a middle class taxpayer to have an increased tax by losing more in deductions than they gain from the lower tax rates, but the vast majority of the middle class will pay less tax because of this bill. Your taxes will be so simple they can be filed on a post card – First off, most taxpayers efile their returns and don’t use any paper. As for the claim that this bill simplifies taxes, well that depends. Currently around 35% of taxpayers itemize deductions on Schedule A. This bill nearly doubles the standard deduction and eliminates or limits other itemized deductions so many taxpayers who have itemized deductions in the past will not be itemizing under the new tax law. So for those taxpayers there will be one less schedule to file with their taxes. There are many other changes in this bill which will create new and complex tax planning opportunities, especially for business taxpayers. Businesses will no longer be allowed to deduct any expenses for doing business. Instead there will be a flat tax on gross receipts – This was never a part of the bill although I did hear this as a proposal before either bill passed the house or senate. I heard a similar rumor regarding the disallowance of all expenses on rental property. Charitable contributions are no longer deductible – This is another false one but I heard it from multiple sources. This bill does eliminate the deduction for certain miscellaneous itemized deductions though. 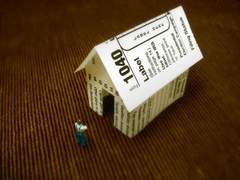 Under prior law these deductions were allowed if they exceeded 2% of your adjusted gross income. This includes deductions such as employee business expenses, investment advisory fees, and tax preparation fees. This bill makes numerous changes to our tax laws. I will be blogging in the future about some of those changes that most affect my clients. My advice would be to not rely on anything you hear in the media but contact a competent tax professional such as an Enrolled Agent to discuss any concerns you have regarding the new tax bill. The IRS has announced the mileage rates to be used for the 2018 tax year.